What's the true cost of replacing electrical switchgear? Circuit breaker mechanisms have a lot of moving parts, that need lubrication or reconditioning. Low- and medium-voltage switchgear and circuit breakers are beyond their expected useful life. It gets to a point that engineers of these plants need to decide whether to replace or upgrade existing equipment. Following are 7 factors they should consider in the decision-making process. I like to compare a switchgear replacement project with a seemingly small house project I recently completed. My wife asked me to replace the old lighting switches in the kitchen of our house, built in 1945. It looked to be an easy and inexpensive project for a Saturday afternoon. I went to the store next to our house and bought the modern switches that she wanted. The project was off to a good start! Back at home, I began work by removing all the cover plates – without using a knife to cut through the paint. As a result, the paint came off with some of the plates, which gave my wife the excuse to repaint all the kitchen walls. To make things a little more dramatic for me, since we were painting the kitchen, she convinced me that it was a good time to replace all the old counter tops to granite! No need to say that my $300 project ended up in the $5000 range. Similarly, in a switchgear replacement project, plant engineers fund a project based cost $X and can easily end up way over budget because of unforeseen issues. These can include replacing cables, cable trays, pads and doors, or even tearing down walls. All are tasks with an associated cost that were not predicted in the original project scope. Old low- and medium-voltage switchgear were built like a tank and during normal environment, they should be able to last decades. Circuit breakers can last 25, 30 or even 35 years depending on the maintenance they had during their operations. However, it gets to a point that outdated technology, reliability concerns and maintenance costs cause them to be prohibitive to maintain. 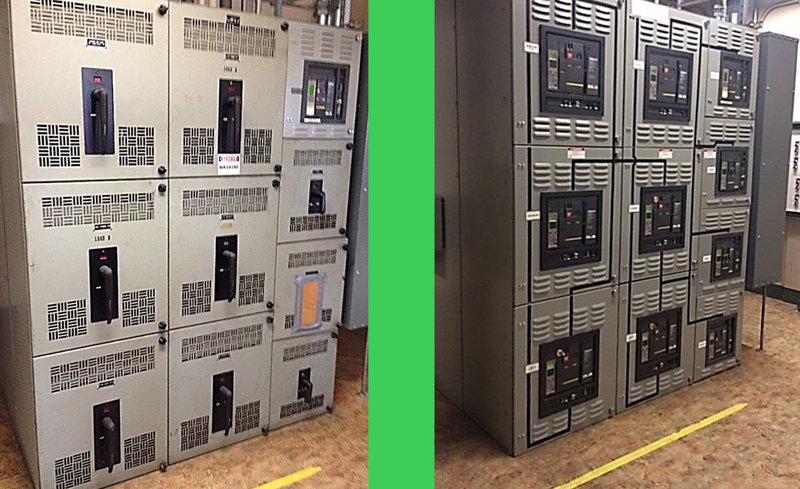 Direct Replacement Solution: Before and after of Westinghouse DB breaker to MasterPact Breaker. Upgrade any brand manufacturer’s brand of switchgear. Extending the life of low– and medium-voltage switchgear with direct replacement circuit breakers is a very good option that can save over 40% of the total cost of a project. In addition, it allows facility personnel to have more control over the total cost of their project, which can be done in phases over the years. Read my next post that features a new modernization calculator tool that simulates the total cost of replacing switchgear compared to upgrading switchgear. It’s a dreaded project and thought to replace switchgears on large facilities, but like you said with the outages that occur and the loss of production that results, enough electrical outages that link back to aging switchgears will quickly make it obvious that it is time. Looking forward to seeing the calculator you’ve created. You are correct! I will share a sneak peek of the calculator tool with you via email. Thanks! Excellent article. Highly agree. Most locations refuse to shut down for the amount of time needed for upgrades and replacements. It costs them much more in the long run. You are absolutely correct Rocky. Thanks! I agree Luiz and like your articals cant wait for your calculator. This will be a great tool to use.